Photographed by: Mel Barlow & Co.
Reshma Shetty walked into her first day of rehearsal for Andrew Lloyd Webber’s Bombay Dreams fresh out of grad school and wide-eyed with hope for the future. 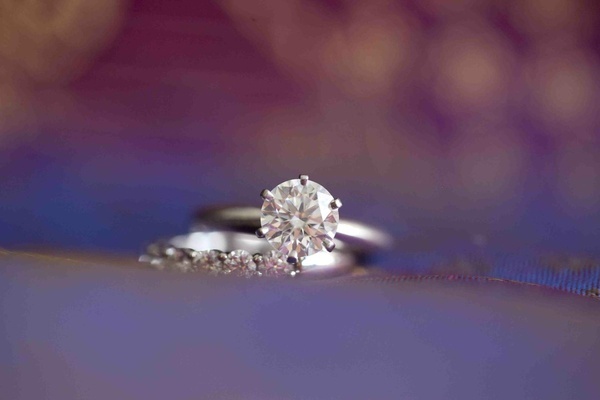 Never did she expect that the handsome man playing her betrothed in the musical would eventually become her real-life fiancé and fill that future with happiness. 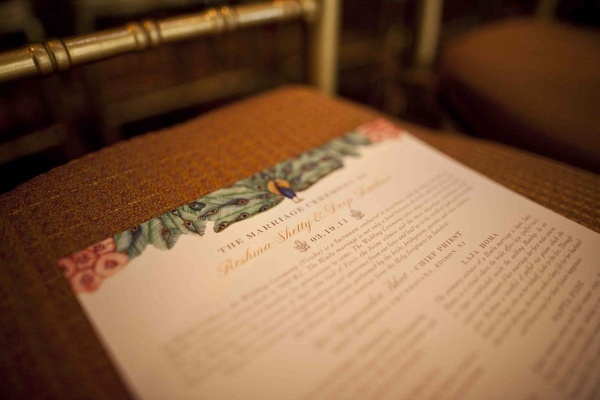 The Royal Pains actress and Deep Katdare settled on a springtime wedding in the heart of New York City, the place where they met and fell in love. 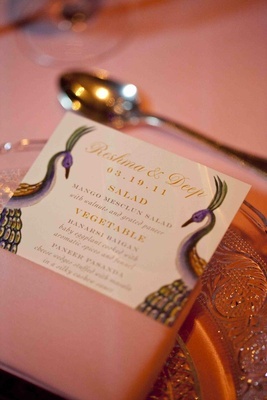 For the couple’s nuptials, Reshma went in search of a place that was beautiful on its own and would not require a lot of additional decoration. “We ultimately chose a venue with magnificent interior and a central New York City location that was easy to reach,” explains the bride. 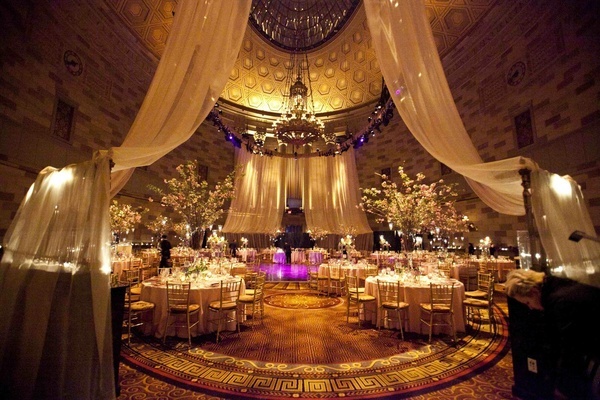 The Grand Ballroom, where both the ceremony and reception were hosted, boasted a glorious 3,000-square-foot skylight of stained glass, a gilded dome ceiling, striking limestone Corinthian columns, and luxurious granite walls, all of which added to the grandeur of the space. 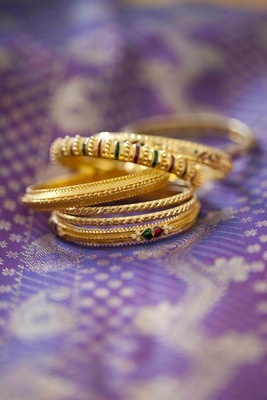 The bride worked with a wedding consultant who helped to guide her in the selection of various elements. 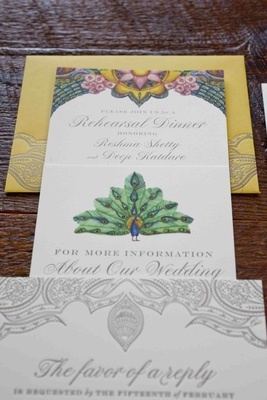 She also took creative direction from her invitation designer, who suggested a unique peacock-themed suite infused with cherry blossom detail. 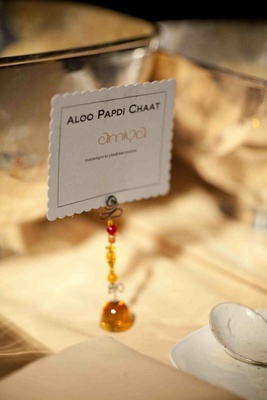 The design was also seen on place cards and menus at the reception, and served as colorful inspiration throughout the event. 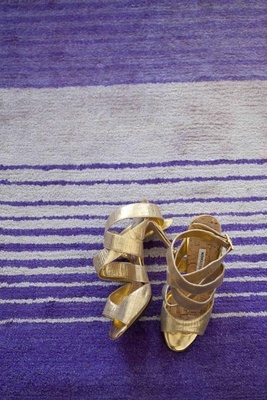 Reshma admits at times it was difficult to convey her ideas, and the endless choices were daunting. “Having a seasoned wedding planner meant that a lot of my worries were [eliminated],” the bride shares. Deep came to the aid of his future wife by organizing charts and managing costs. “We sometimes felt like producers for our first Broadway show,” Reshma remembers. 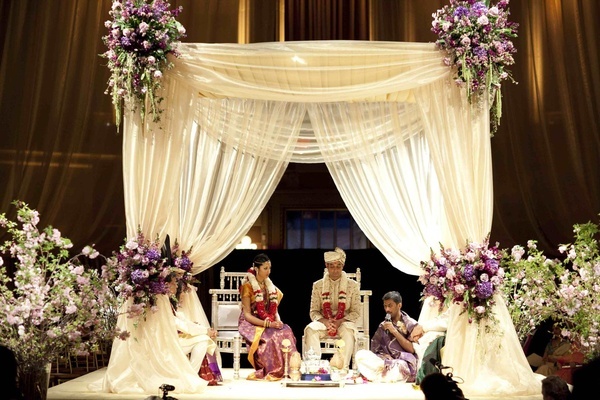 A beautiful custom-made mandap was created for the vow exchange using gorgeous fabric. 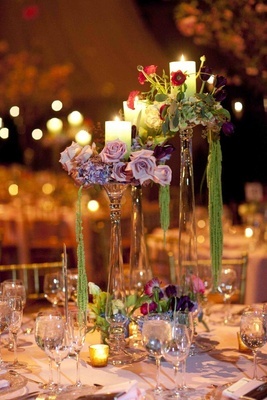 Each pillar was wrapped in lavish material and fastened by a softly colored floral arrangement. 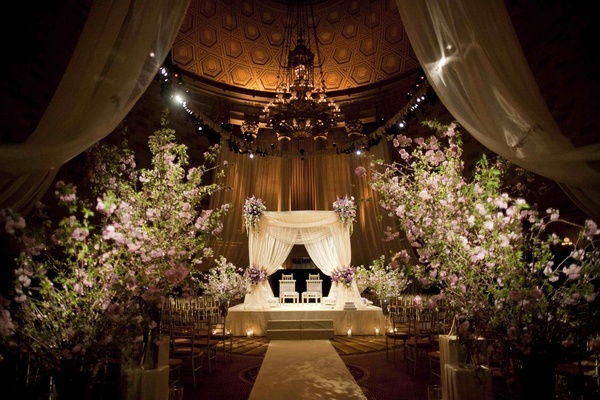 The stage-like area also featured a canopy of luxurious satin with additional bunches of flowers in shades of lavender and violet, while soft white candlelight surrounded the gorgeous platform. 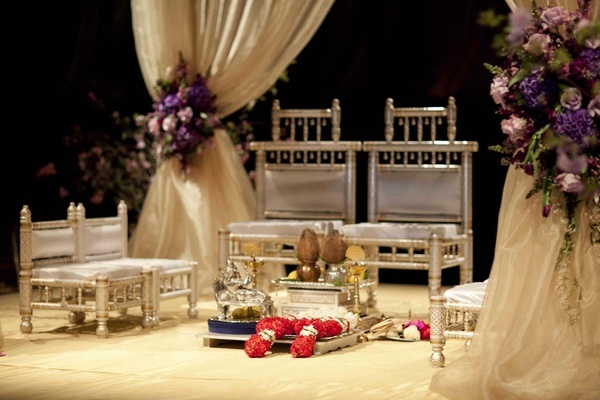 “We chose theatre-in-the-round seating because we wanted everyone to understand the ceremony and feel like they were a part of it,” describes Reshma. The room was also heavily dotted with stunning arrangements of cherry blossoms (a favorite flower of the bride), and amber lighting lent a romantic ambiance to the space overall. 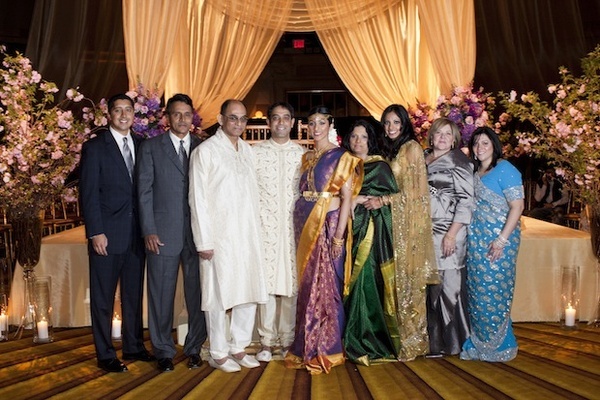 The couple chose to have a Hindu ceremony that incorporated wedding customs from their respective origins in India, but also opted to follow a Western format in lieu of the usual multiple-day affair of which Indian ceremonies typically consist. 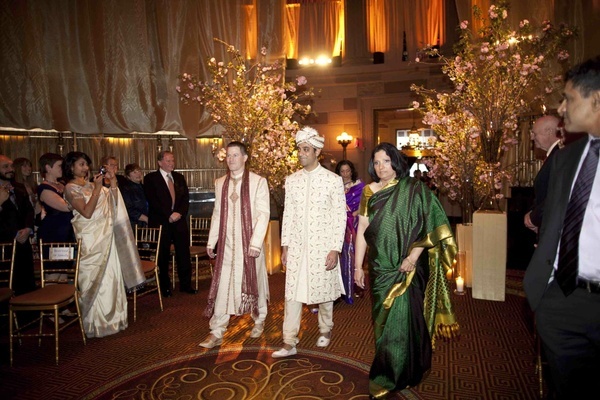 The nuptials were performed mostly in Sanskrit, but included intermittent explanations of the rituals in English so that non-Indian guests could understand and appreciate the significance. Reshma dazzled in a traditional lehenga of rich purple and gold, paired with golden sandal pumps for a touch of Western flair. 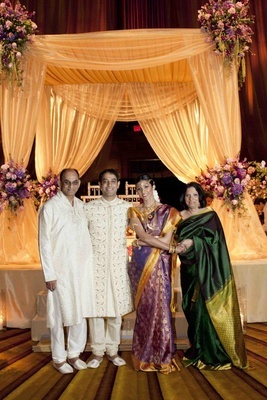 Her gown was a gift from her mother and featured kanjiram silk, which is specific to the bride’s southern caste tradition. 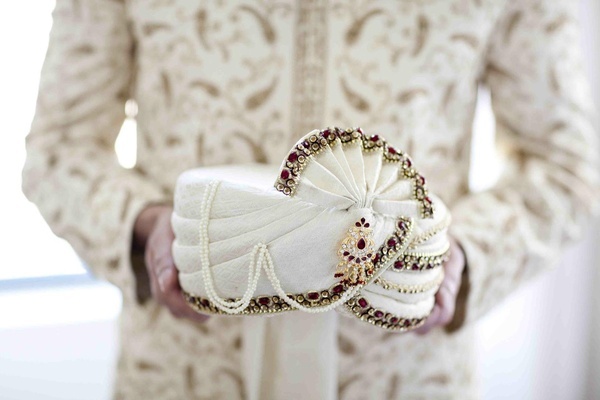 Deep was regally clad in an ivory sherwani of raw silk with brocade-threadwork embellishments. While guests enjoyed post-ceremony cocktails on the balcony, the rotunda-shaped Grand Ballroom was transformed into a reception fit for royalty. 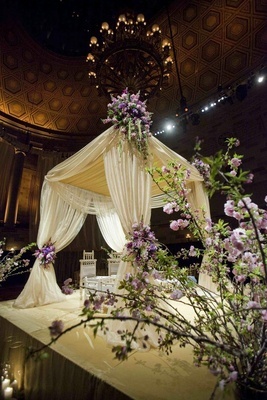 “The décor was beyond magnificent,” remembers the bride. 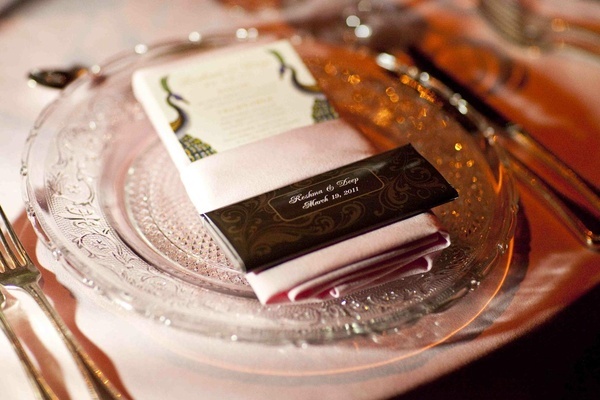 Tables were draped in champagne-hued linens, and charming menus were placed on pretty crystal dinnerware edged with a filigree design. 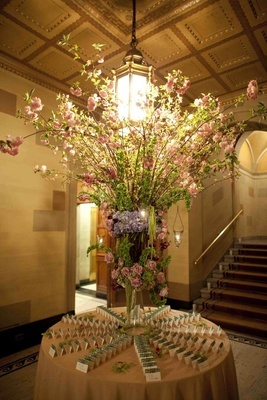 Some tables featured lush cherry blossoms in tall crystal vases, while others were adorned with stunning spring flower arrangements of roses and ranunculus blossoms. 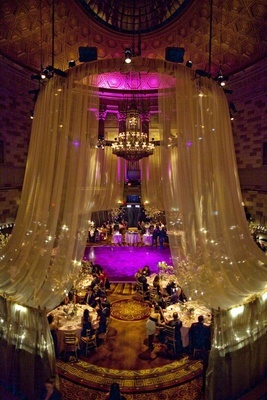 The room flaunted an abundance of candlelight per the bride’s request, and sheaths of sheer fabric enveloped the space in gold. 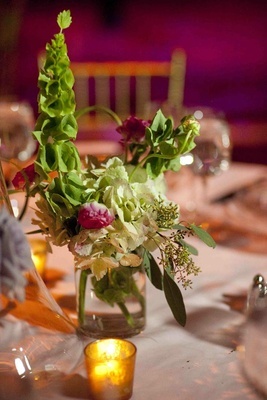 “The room felt like spring heaven,” confirms the bride. 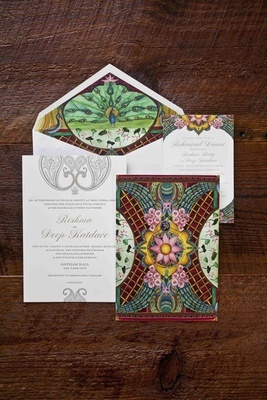 “It was spectacular.” The dazzling décor was visually stunning and illustrated the warmth and beauty for which the bride had hoped. “The room exuded everything we wanted,” she confirms. 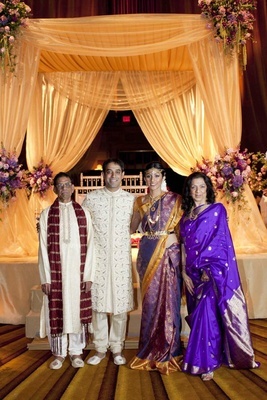 An elegant sit-down dinner consisting of a selection of Indian dishes was served family-style. The caterer had artfully arranged the well-known curry dishes so the meal had an exotic, unique presentation. 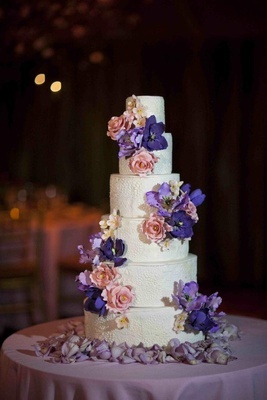 Supper was concluded with slices of the couple’s six-tiered wedding cake in an assortment of flavors. 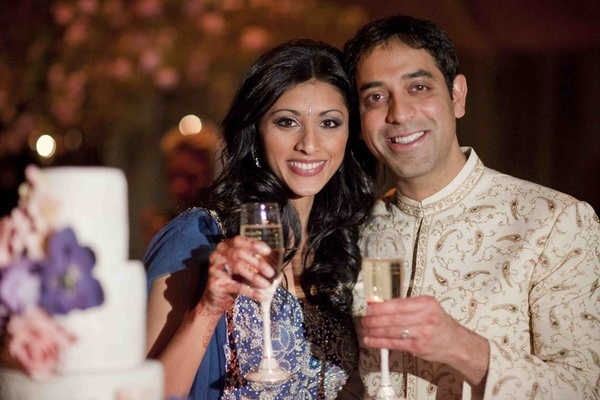 The crowd was full of smiles as the couple took to the stage for their first dance outfitted in new ensembles. 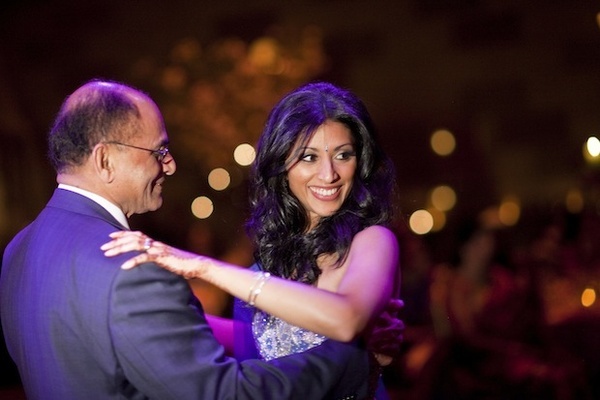 Reshma and Deep slow danced to a Celine Dion song until the bride’s sister suddenly interrupted; and right on cue, the couple broke into a choreographed Bollywood number. 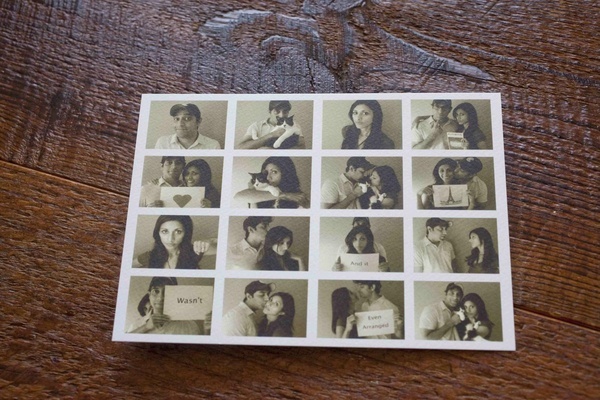 “It was hilarious,” shares the bride of watching her loves ones’ reactions to the dance. Bentley Meeker Lighting and Staging, Inc.